Have you ever had a fight with a pattern? I just did, and then in the midst of it, I ran out of yarn. My inherent stubborness plus the time I'd invested kept me going, and in the process I learned a few things. Just because a pattern costs money doesn't necessarily mean it's well written or that it's been proofread! I've had great luck though with most patterns, purchased or free, so I can't really complain. It was a good reminder however. Had I known about and used the feature on Ravelry that shows comments from other knitters about a particular project, I would have known that others found the directions difficult also. If you ever run out of yarn on a project and it hasn't been years since the yarn was purchased, get in touch with the yarn shop where you purchased the yarn. Chances are they may still have yarn of the same dye lot. (Better yet, buy an extra ball the first time!) I've lucked out twice thanks to keeping track on Ravelry where I buy my yarn. So what do these devilish booties look like? Ta Da! 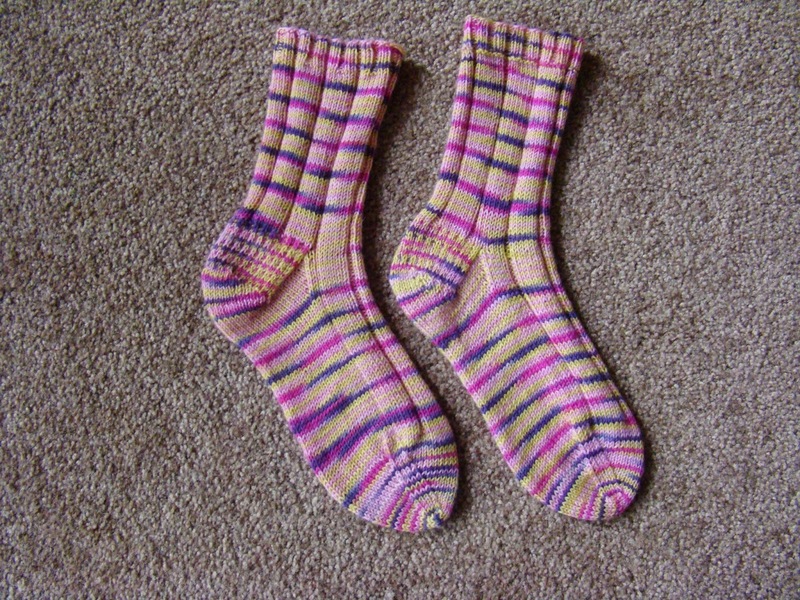 I finally finished these socks this past week also. That yarn was fun! 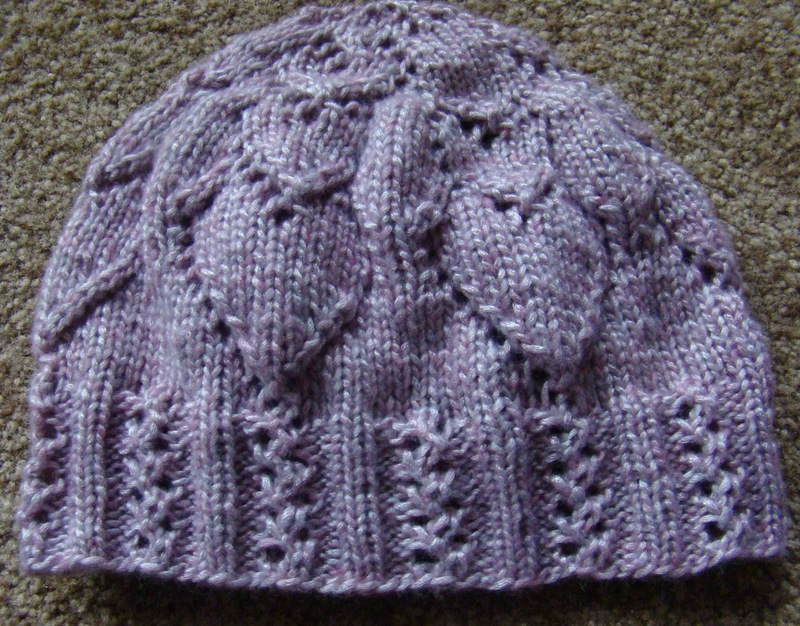 This is the Simple Skyp pattern minus the Skyp stitch which didn't show up well with this yarn. One of these days I'll finish socks with the whole pattern! Have a happy week! Fiber Is Good for You! Don't You Agree? This was in downtown Seattle near Pioneer Square. 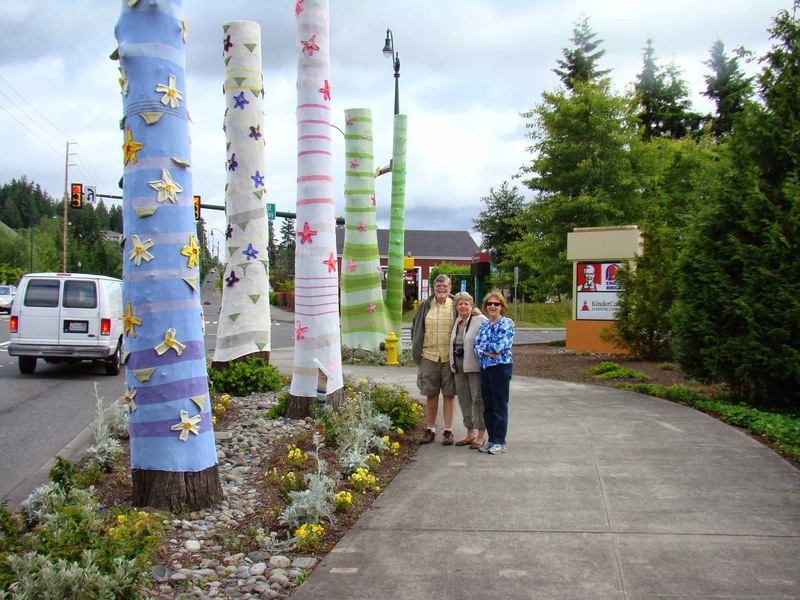 Suzanne Tidwell, a local fiber artist, beautified these abandoned stumps in Sammamish. This was the spring version. 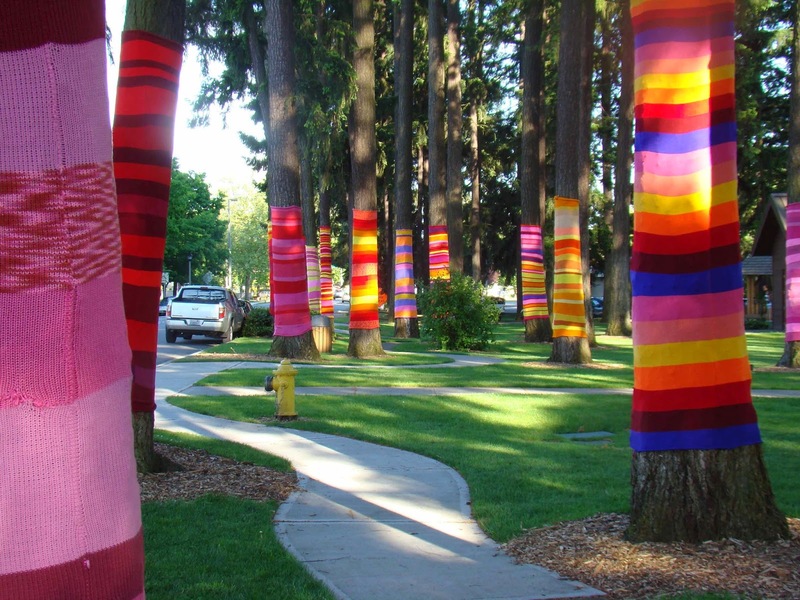 These trees in a Kirkland park wore their "sweaters" for quite a while. 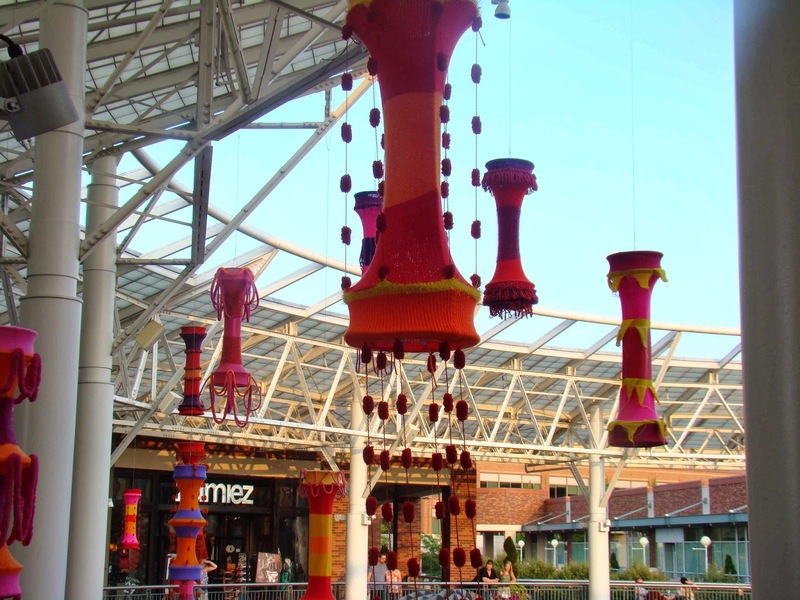 I think these huge pieces were done on a knitting machine. A yarnie side trip to Darn. Knit. Anyway. 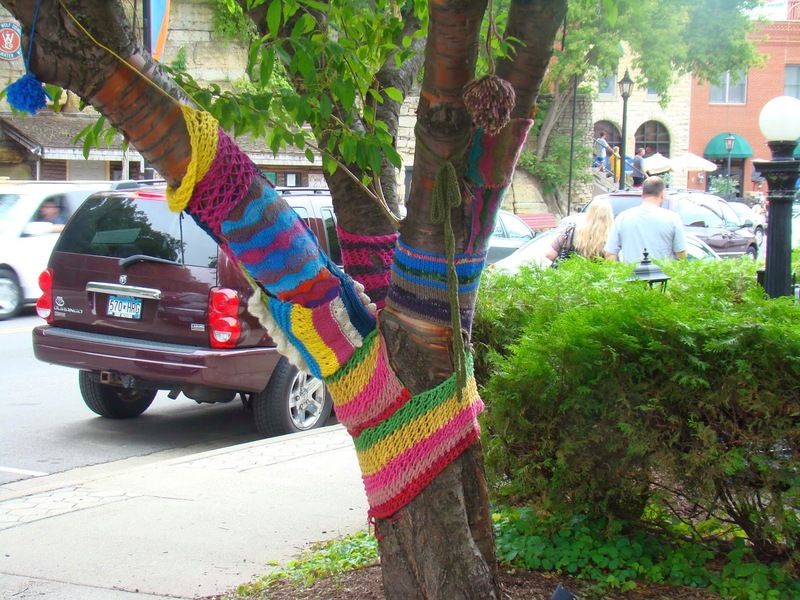 in Stillwater, MN, during a family reunion added to my yarnbombing collection. 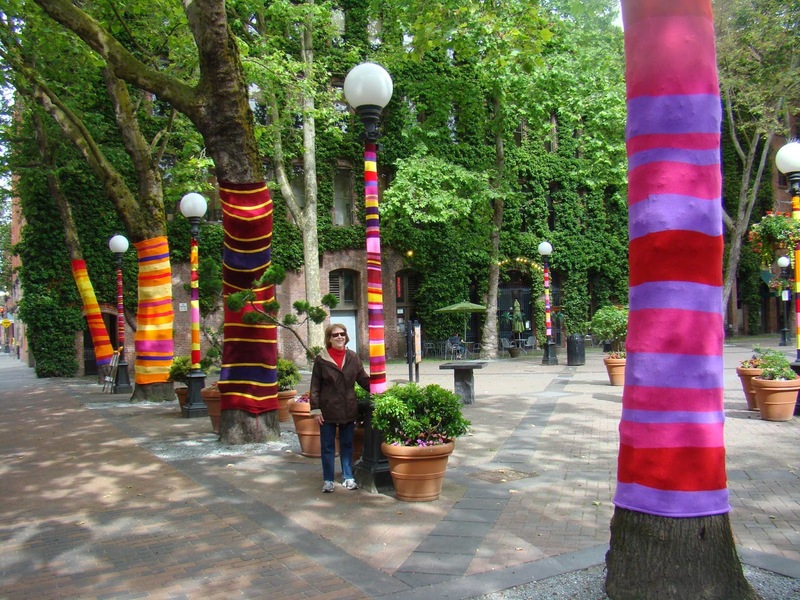 If you Google "yarnbombing," you'll see lots of other examples from other cities. 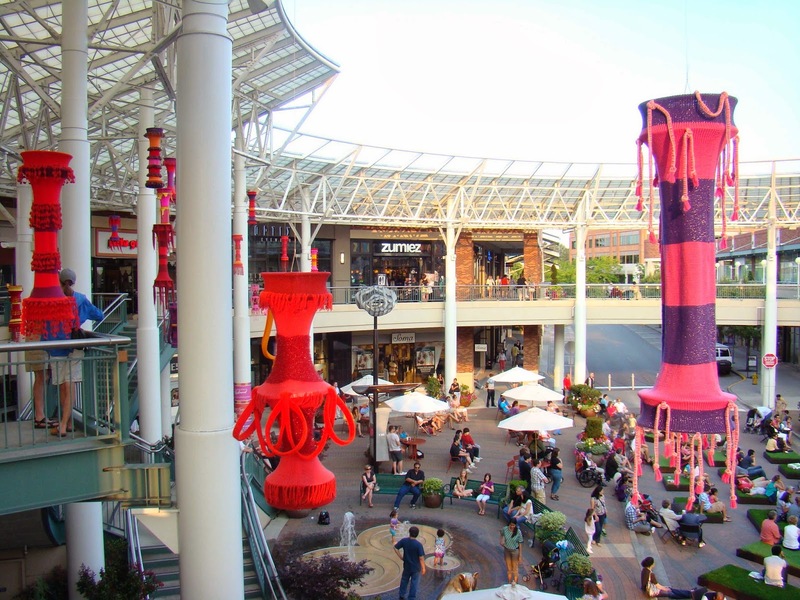 Meanwhile, back in Washinton, this was featured in a local shopping center and then, according to Tidwell's blog, moved to a museum. We haven't seen any more lately but probably we haven't looked carefully. How about you? 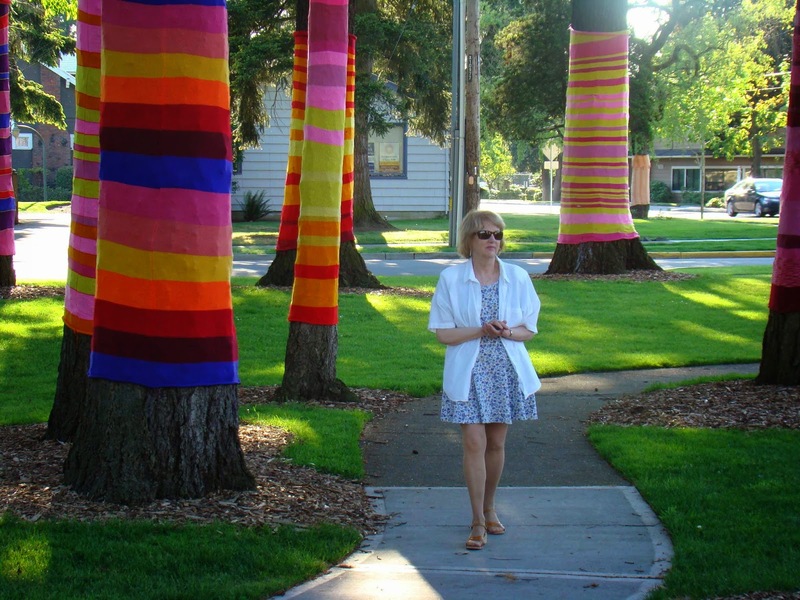 Have you seen evidence of "yarn bombing" in your town? Incidentally, I'm not crazy about that term, but I've also seen "yarn guerillas" which seems worse. I'd much prefer "yarn art"! I'll bet these projects, however they're done, made a serious dent in someone's stash! 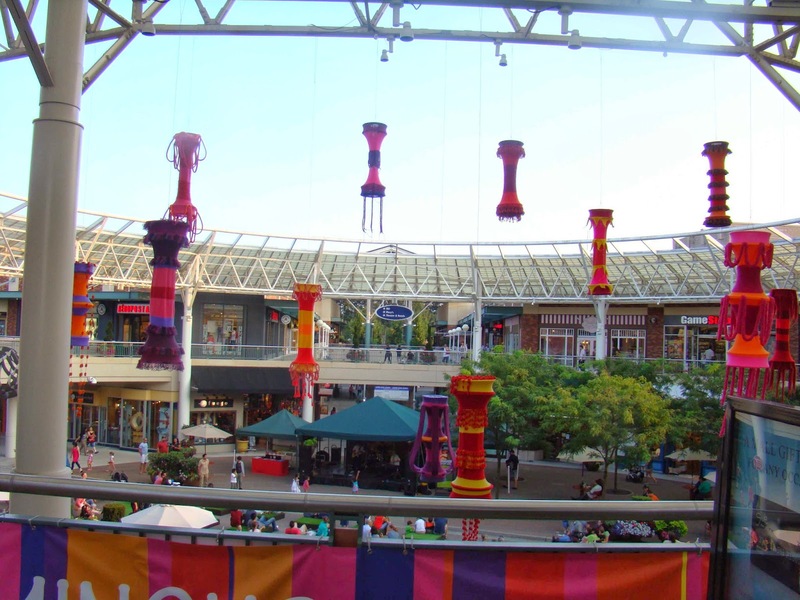 Check out Patchwork Times for other knitters' projects. We had a couple of nice days weatherwise which got me out in the yard to do a bit of work. Aren't these pretty? The sunshine encouraged them to bloom. 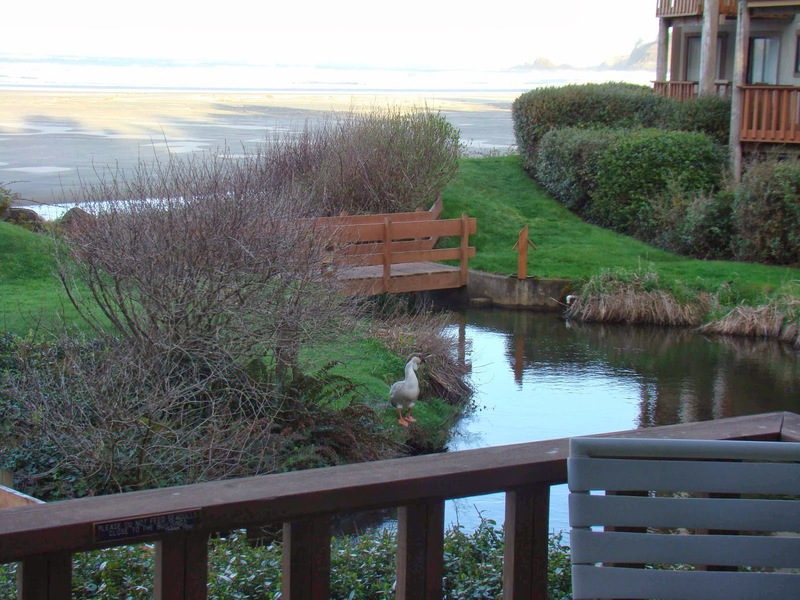 Then on Friday we headed to the Oregon Coast for a long weekend. 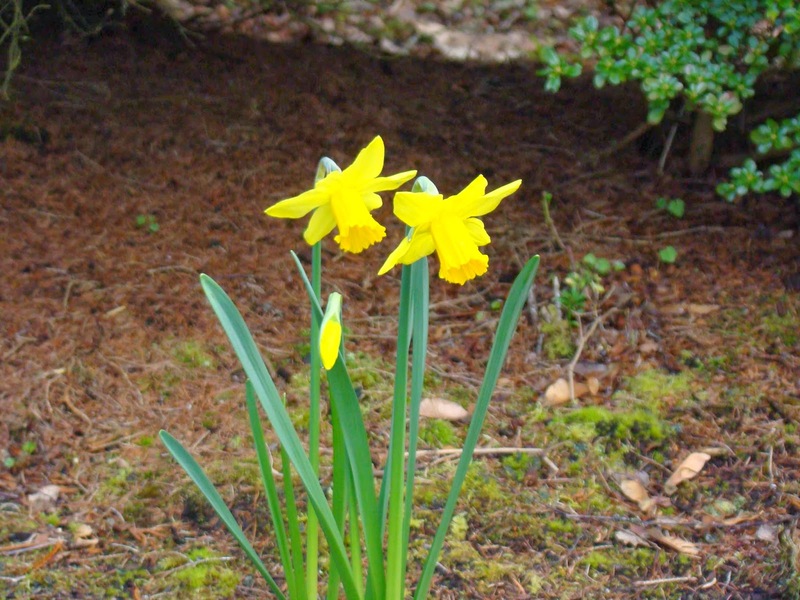 We saw lots of signs of spring on the way there, but the weather didn't hold. It was windy and chilly most of the time, but we had fun anyway. 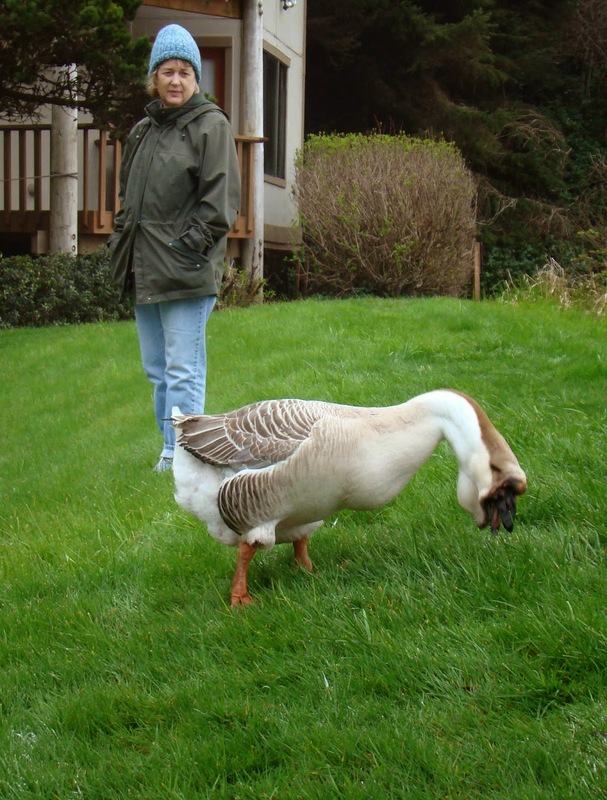 just a bit intimidating up close and quite different looking from other geese we've encountered. 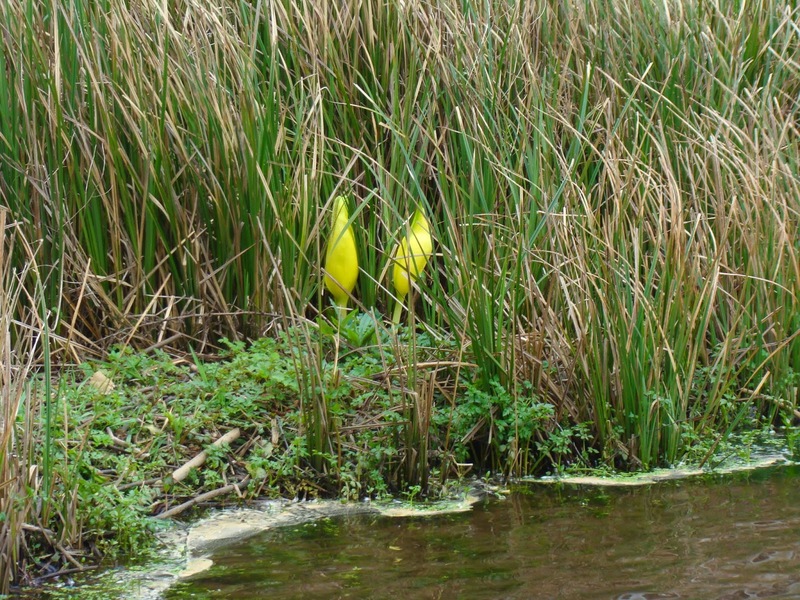 Skunk cabbage was blooming among the grasses. 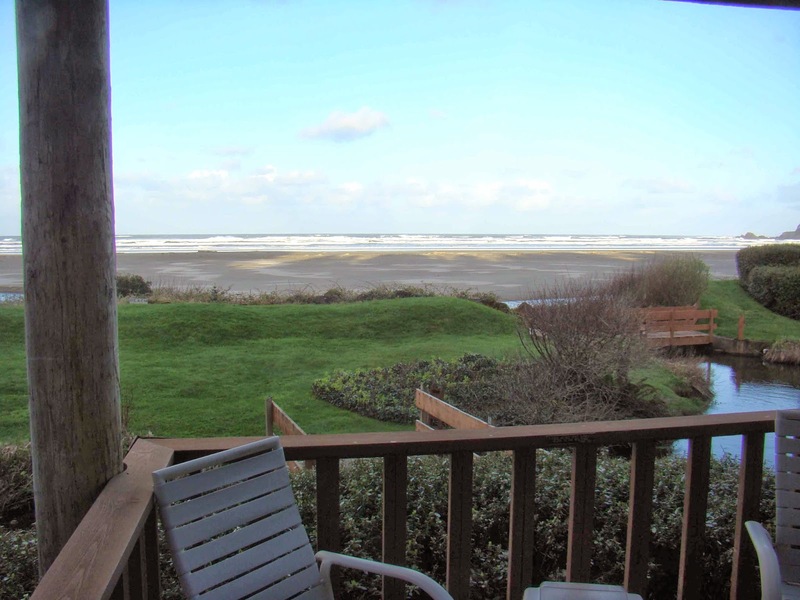 Of course the sun came out on the day we left after a rip-snorting storm during the night. 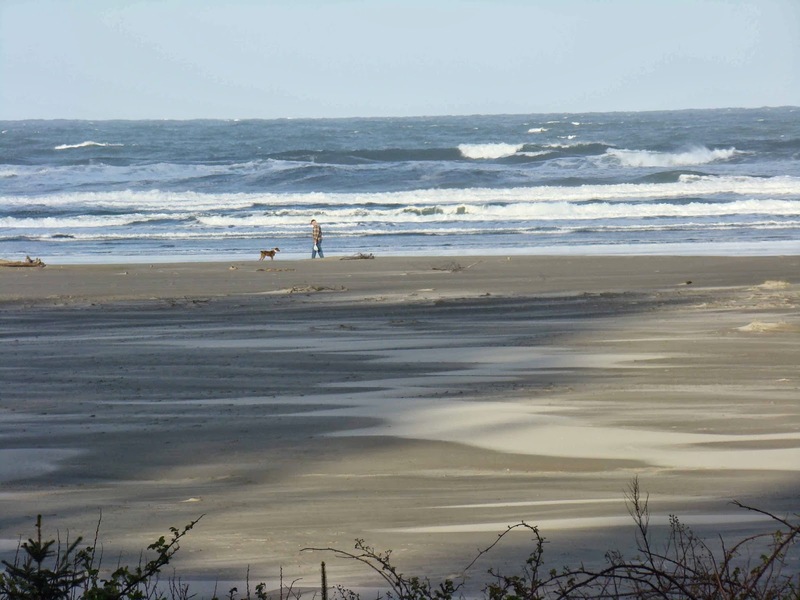 You can see how wet the sand is, but someone was already enjoying the beach. 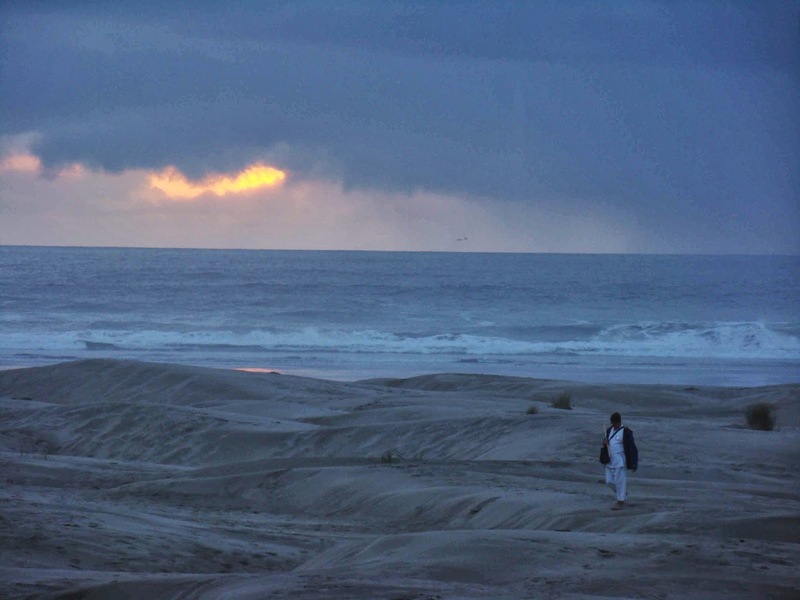 We were amazed at how the winter winds and rains had flattened out the dunes that we'd walked on last September! Here's what it looked like then. Quite a difference, eh? Well, back to work; there's lots of catching up to do. 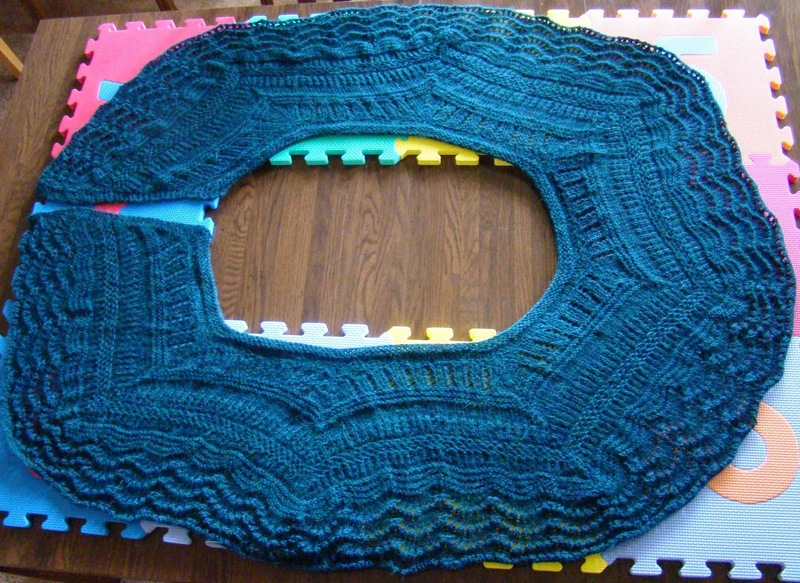 Well, I bit the bullet and am finished with the Downton Abbey Shawlette. It looks so different from what I imagined and should be very warm as it's quite long. 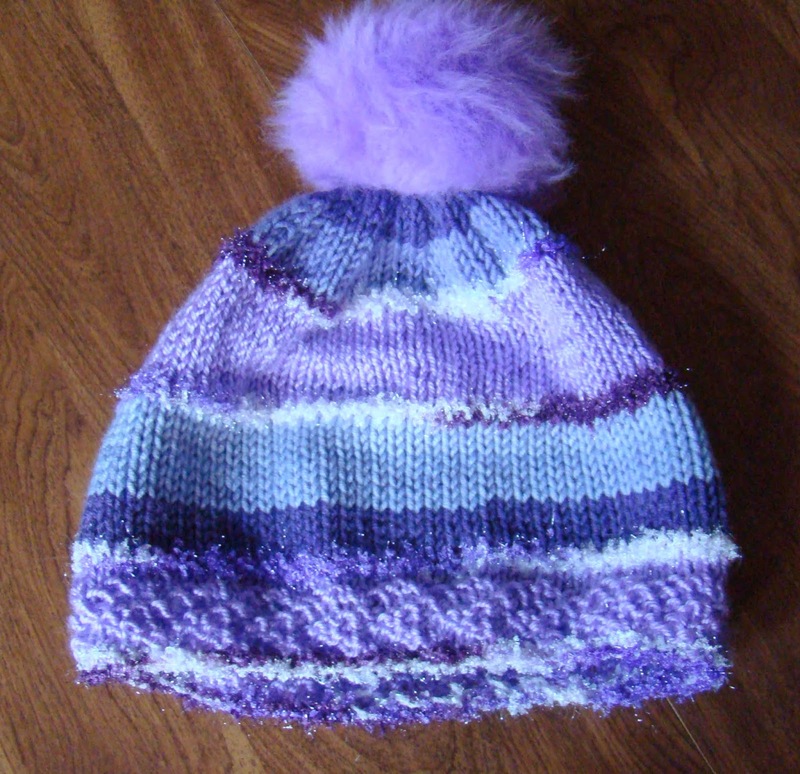 This hat is finished, too. It's going to a friend who's having another chemo treatment tomorrow. I hope it cheers her up! Some how this project hopped onto my needles. 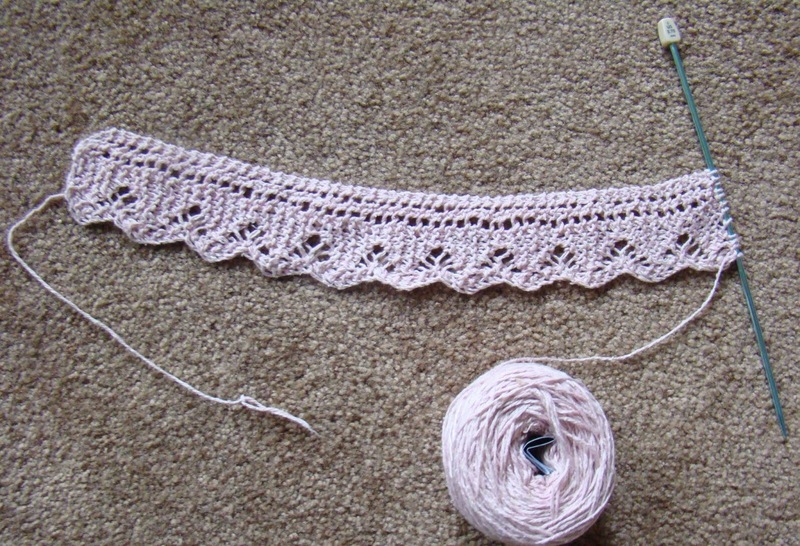 It's another shawlette and has a very interesting construction. 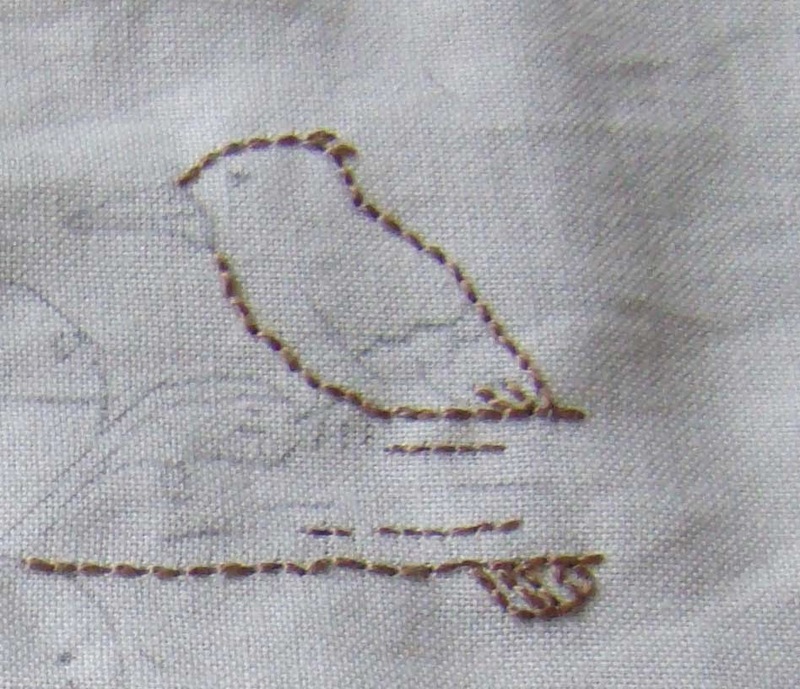 The edging is knitted first and then the rest of the 271 stitches are picked up on the edge. We'll see how that goes, eh? Mama Kingfisher is the star of block 7, and you'll be happy to know that block six is all done, too. 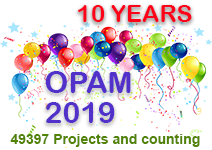 If you wish to see what other folks are knitting, tune in at Patchwork Times; you won't be sorry! I'm off to fold laundry.